The Reviews Section has been growing rapidly and within 2 months has accumulated hundreds of products, with their ingredient lists, prices, comedogenicity information and most importantly, your valuable reviews. Recently we buckled down, whipped up a storm of code and added more functionality that will help you zero in on the exact products you need. Those who’d rather skip the details can go and play right away. 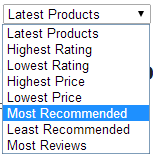 Now filter reviews right down to the exact product type you are looking for. Want to see face washes which most users recommend? Or spot treatments with the highest user rating? It’s dropdown easy now. You don’t have to wade through pages of products with zero reviews. When you check the box, we make sure you see products that have at least one user review. Say you are in the market for a new face wash for acne prone skin. Go to the reviews section and set your filter to face wash, most recommended and with at least one review. Voila! Want to give it a whirl? Go to the Reviews Section. Many times we discuss individual products in the community, but those threads get buried after a while. Whenever you want to rant or rave about a product, add your review to the review page of that product. Then link to that review page in your community conversation. When you review a product, you get to voice your true experience with it. Seeing you, more people will do so. That way, when you are considering buying a product, you can rely on others’ reviews of it. Since APST information is woven into each person’s review, you will get a better idea reading reviews here than from random folk on the Internet. While adding reviews, write a bit more than ‘good product’, ‘nice product’, ‘didn’t work for me’. If you were looking for reviews, how helpful do you think you will find these one-liners? Not much, right? Take your time, share a little bit about what you liked about a product, what you didn’t like and whether it helped you in any way. This will also justify to a reader of your review why you think that way about the product. If you don’t see a product you want to review or want to see reviewed, simply let me know by posting an update on my profile. We are committed to adding features to make your life easier and features that will help you get the most out of this website.